Muslims, Dalits and tribals together account for 39 per cent of India’s population, thus their share among undertrials is disproportionate to their population. The three communities have a lower representation among convicts as compared to undertrials. Together, they account for 50.4 per cent of all convicts. OVER 55 per cent of undertrials across the country are either Muslims, Dalits or tribals, according to the National Crime Records Bureau’s prison data for 2015. 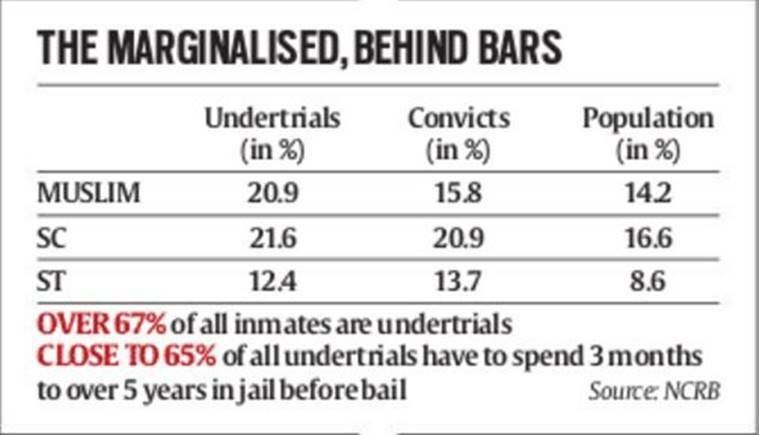 According to the NCRB, over two-thirds of all jail inmates are undertrials. The data also shows that more than 70 per cent of undertrials have not passed Class 10. SCs account for 21.6 per cent of undertrials and 20.9 per cent of convicts, while STs make up 12.4 per cent of undertrials and 13.7 per cent of convicts. Out of 2,82,076 undertrials lodged in various jails in the country, a total of 80,528 undertrials are illiterate (28.5 per cent) and 1,19,082 have education levels below Class 10 (42.2 per cent).